In case you haven’t figured it out on your own yet, Italians love to party, and even if Christmas (or, as in my case, Hanukkah) has left us exhausted and bloated, we would never give up an opportunity to celebrate again – and here comes New Year’s Eve! As opposed to the religious holidays, New Year’s Eve is usually spent with friends rather than family – which can translate into much wilder festivities! Over-the-top midnight fireworks welcome the new year in the center of most towns (Naples boasts one of the best), but people also tend to include firecrackers and sparklers in their private parties, which keeps the ERs quite busy., Talking about accidents, some places in the south follow the puzzling custom of throwing old things out the window to symbolically accept the freshness of the New Year: watch out for appliances such as washers and dryers around midnight!!!! In Venice, where I grew up, people stick to safer games, such as playing Italian bingo (tombola), and perpetuate the suggestive tradition of wearing red underwear (for love, and good luck), hoping to be kissed under the mistletoe at midnight. But what can’t be missed is the breathtaking midnight celebration in St. Mark’s Square, complete with fireworks, music, prosecco and bellini toasts, and exchanges of kisses at midnight. The most sophisticated make sure to by tickets for the spectacular Concerto at La Fenice Theater, while the adventurous take a chilling swim in the waters of the Venice Lido. As always in Italy, food also plays a major role. Everybody seems to serve lentils, which, thanks to their coin-like shape, symbolize money for the coming year. The traditional dinner often includes a cotechino, a large pork sausage, or a zampone, stuffed pig’s foot, which I am going to skip since I keep kosher – but you can check them out on my friends’ websites, Memorie di Angelina and Academia Barilla (the idea is that the fat in pork also symbolizes wealth). Lastly, grapes, which everybody gorges on following the saying “eat grapes on New Year and count money the rest of the year”, and the pomegranate, which is associated with abundance and fertility. 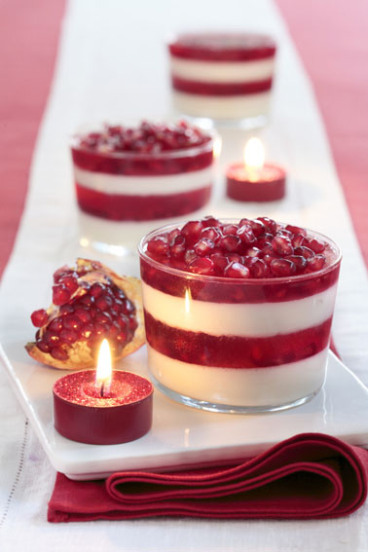 From ancient Egypt and Greece, to Persia, to Judaism and Christianity, the Hindus and the Chinese, so many different cultures have seen the pomegranate as a symbol of prosperity, that it seems to me like the perfect choice for a celebration that in Italy today unites people of different backgrounds (much like the American Thanksgiving). In the Jewish tradition we also serve it on Rosh haShana, the Jewish New Year, as a symbol of prosperity and of all things good (our sages say that all its seeds represent the 613 commandments in the Torah). What a better way to ring in 2013 with high hopes of health, peace and love? Halve a pomegranate, and set aside the seeds. Press them with a potato masher to obtain about a cup of juice. Set aside. In a heavy (or non-stick) saucepan or skillet, heat 1 tbsp olive oil and add a sprig of rosemary and 1 clove of garlic.When the garlic is golden brown, discard it and add ½ cup wine and the pomegranate juice to the pan. Season with salt and pepper and allow to thicken on low heat, stirring occasionally. Add the pomegranate seeds and cook for 2 more minutes. Heat a tablespoon of olive oil in a small skillet, add the scallion or onion and cook until translucent, adding a little water if needed to prevent it from sticking or turning brown. Drain the scallion from the oil and let it cool. In the meantime, soak the bread in broth until soft, then drain, squeeze all the liquid out, and set aside. In a bowl, combine the ground turkey with the cooked scallion, the salt and pepper, parsley, drained bread (or mashed potato), nutmeg, egg; mix everything together, working quickly with your (if you are not on a low-sodium diet you can also add two slices of a natural salami, very finely minced). Allow to rest for two minutes until it firms up, making the mixture easier to shape. Arrange the meatballs on the parchment in one layer and lightly spray the top with a little more olive oil. Bake until golden (about 30 minutes) in a preheated oven at 400 F. Serve with the pomegranate sauce. Enjoy! Panna cotta (cooked cream in Italian) is a traditional dessert from Northern Italy, prepared by simmering milk, sugar and cream and mixing them with gelatin. It literally takes minutes to make, but never fails to “wow” the guests. 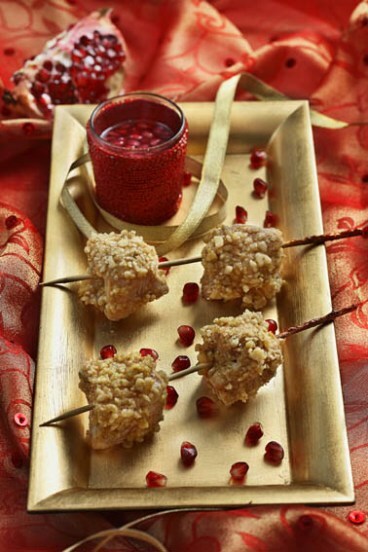 For a holiday version, I spiced it up with ponegranate seeds – a symbol of prosperity and good luck in many different traditions, not to mention a perfect contrast of color and flavor with the cream. Serve it for Hanukkah, Christmas, New Year, or a romantic anniversary dinner! Soften about 2/3 of the gelatin in a few spoonfuls the cold milk. Heat the rest of the milk with the sugar and the cut vanilla bean. Once it’s hot, stir in the gelatin mixture and mix until smooth. Allow to cool, discard the vanilla bean, and stir in the heavy cream. Pour about 3/4″ of this mixture into 4 glass cups and transfer into the freezer for a few minutes until the mixture thickens. Soften the remaining gelatin in about 2 or 3 tbsp of the pomegranate juice. 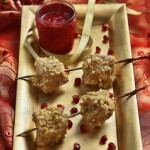 Heat the rest of the pomegranate juice, stir in the softened gelatin, mix well and allow to cool. Once the first layer of cream mixture has thickened, pour in a layer of pomegranate mixture, mixed with a few pomegranate seeds, and put the cups back into the freezer. 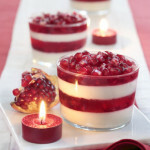 Repeat with one more layer of cream and one of gelatin and pomegranate seeds. Top with a few more pomegranate seeds right before serving.